Obamacare Buried By Avalanche Of Negative Ads, Study Finds : It's All Politics According to an analysis of Affordable Care Act advertising, an unprecedented amount of money was spent on negative ads attacking the law. And very little was spent defending it. 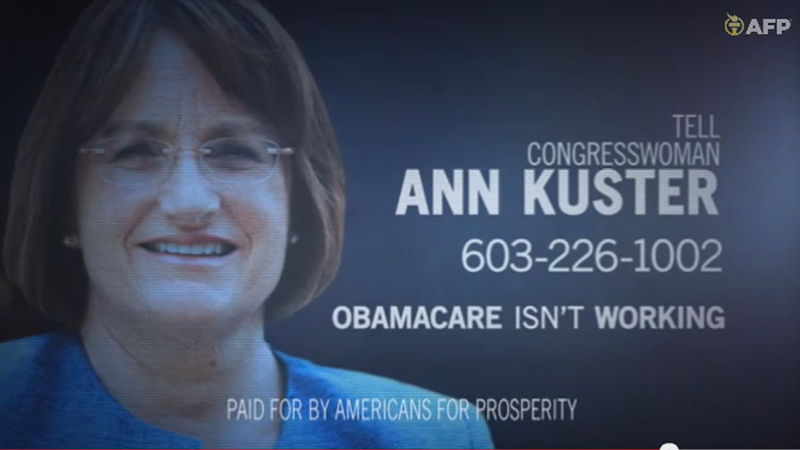 A frame grab image from video provided by Americans for Prosperity shows a political ad against Rep. Ann McLane Kuster, D-N.H., stating the Affordable Care Act is not working. It's been obvious ever since 2010 that Republicans and conservatives were spending a lot more slamming the Affordable Care Act than the Obama administration and Democrats were spending to defend it. Yes. That's the ratio calculated by Kantar Media's campaign media analysis group — CMAG to political junkies. Kantar estimates that national advertising against the ACA cost $418 million, compared with $27 million for ads supporting the law. Kantar calls the anti-ACA spending "unprecedented [and] largely unanswered." Even in general election-focused ads this year, 76 percent of Republican ads airing from January through April attacked the health care law. In Senate campaigns in New Hampshire and North Carolina and in 13 House races, Kantar found that every GOP broadcast ad brought up the anti-ACA messages. Kantar's Elizabeth Wilner, a co-author of the analysis, said, "Positive ads about the ACA are still so rare that whenever one appears, it gets a national news story." This massively lopsided spending is also a complete reversal from 2008, when then-candidate Barack Obama's campaign aired one contrast ad on health care policy 24,000 times. Kantar says that's a record for the past 10 years — at least. But in 2012, the Obama re-election campaign ran just one ad on the ACA. Yet in 2013, when millions of Americans had to sign up for coverage, industry spending spotlighted the differences of magnitude between American politics and American commerce. In just six months, insurance companies ran ads costing an estimated $381 million, not far behind what the law's critics spent over four years. The industry ads were neutral, neither attacking nor defending the law — "Switzerland," as Wilner put it. Overall, she said, three factors — Republican intensity against the law, the new federal role and insurers' new activity selling insurance to consumers — came together to produce "a confluence of political and product advertising never seen before."